Check out the crafty goodness I found at my parents’ place this past weekend! I was finishing up the sort/purge of my old bedroom, before my parents move to Singapore, and came upon a bag of stuffed animals. I found some old best friends, of course. I love that my uncle, in his mid-twenties when I was born, kept giving me white toys. But I also found some nifty, crafty items–both homemade. First up, the birth of amigurumi! 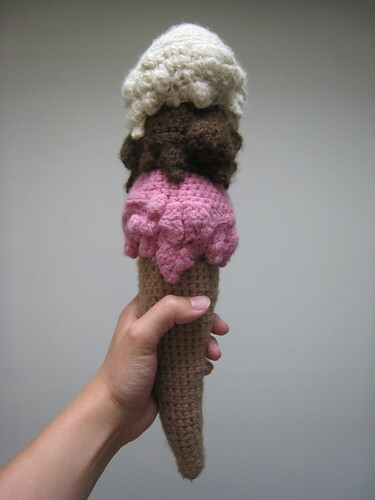 Crocheted in the late 70s, this ice cream cone was made for me by my mom. I wish I knew crochet well enough to figure out how to make those blumpy spots of melting ice cream, because otherwise I suppose this would be pretty easy to make. I say this, of course, but I know nothing about crocheting toys–any experts out there got any ideas or patterns? I’ve been itching to try some amigurumi, but my crochet skills are pretty nonexistent. I used to claim I knew how to crochet, but a friend recently pointed out that I wasn’t doing enough wraps on what I thought was a double crochet, so I shrug and now claim that I could know how to crochet, if I put my mind to it. And I’m thinking about putting my mind to it soon. The other find was my first sewn toy, made in Home Ec in 6th grade. I remember that we had a choice of animals, but I have no idea what the other options were. I feel as though most people made the shark. I’d forgotten all about this guy until he came peeking out of the bag. I think smaller versions would be very cute for baby gifts! Ooh, I think I had the same bear as the 2nd from the left! Too cute. I still have the stuffed boxing glove pillow I made in 7th grade Home Ec. It’s pretty ridiculous. Your post made me laugh out loud — I have the chicken that I made in 6th grade home ec still, too (don’t know why I chose the chicken but I think it’s because that’s all that was left to pick). We sewed stuffed animals in my home ec class too – I made a whack of them for christmas gifts that year. Yours is very cute! You are freaking me out right now because I made that EXACT SAME SHARK in home ec!! Wow. That ice-cream is phenomenal. And I love your first home-made soft toy!! I made the same shark in 7th grade home ec! Wait! Your parents are moving to Singapore? the ice cream is great!!!!!! I bet someone out there will figure it out!!!! aw, i had grumpy bear too. now the peanut has him! OMG! That ice cream cone is great!!! The ice cream cone is awesome! hum. maybe you’re my twin as well. The last time that I went to my parents house I picked up (among other things) a bag of my best loved stuffed animals and crafty things that I made as a kid including two L-shaped pillows. I made the pillows (my initials) in 7th grade Home Ec after I finished making the required sweatpants. I wish I could have made a shark instead. This is off-topic but I want to download the Zokni socks, but all I get is pictures with gibberish. Any idea what’s wrong? I have a Mac, btw, if that makes a difference. It’s a really cool sock…. I would totally put the ice cream cone in a big shadow box frame and hang it on my wall. It’s too awesome! I love the ice cream cone. Fiberlicious, truly. I never took home ec, it wasn’t offered in my schools (the administrators thought of themselves as progressive, I guess). I love all the cuteness on this post today. It makes me wish that I had sat through a a home economics class or two! so much awesomeness in this post!!! in my home ec, we made gross biker shorts. blech. the ice cream cone is fabulousness. and i think that i had all of those stuffed animals…. Good lord–I had to do a double take when I saw that frickin’ shark! I had the same one on my bed from 1980-84. Take that Discovery Channel Shark Week! Heh! And how hilarious that there are like four other people commenting on the same thing. Hmm… Perhaps there’s a chance to redo that a create a sew along. We’ll single handedly bring back these sharks from being nearly extinct! Go sharky! That ice cream cone is so. cool. Heh, I still have an ostrich that I hand-sewed in middle school, although poor Ozzy looks pretty worse for the wear. OMG! You found my shark! Ok, it’s not MY shark. Mine was yellow. With orange fins. Holee crap. I’d forgotten all about him! You know, that shark looks just like the fish that Julia just knitted up for the Fricklet. Are knitted sharks the new sewn sharks? Wow, that shark looks like a fun project! I think our Home-Ec classes made lame-o aprons. I took shop instead (you could only pick one). 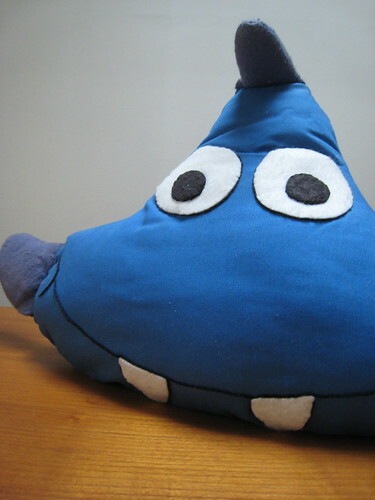 “Blumpy” is an excellent word. I love your shark!!! It’s so cool, in my home ec we just learned to do laundry, make an omlette & balance a check book. Man did I miss out! Wow, your home ec class was cooler than mine. Our choices were either a tote bag or an apron. Pattern is from Annie’s Attic. They don’t show it anymore, but they do have cakes and cupcakes. I still have my ice cream cone, too! I made the shark in junior high home ec as well, back in… 1980? Everyone else in my class who made the shark made it in blue, but I somehow thought mustard yellow with green fins would be a good idea. My mother still has it on prominent display in her TV room. Ouch. AHH! I totally remember when we made those sharks in home ec!! I think mine might have been a little lopsided. Didn’t we also make white sweatshirts?? The thought of it still haunts me to this day. OMG! I recognize that shark! I made a goofy bear, but it was in the same line of patterns. And i am looking for those patterns! Anybody know what company made those patterns or where to find them??? Everyone around me is pregnant or with toddler so it’s time for a revival of the jr high stuffed animal/pillow! Funny! Talk about a blast from the past!I made the shark in blue and in green (named Herman and Hermione, don’t ask why, I have no idea), to go along with my dad on road trips. Would love to find the whole range of these patterns to make with my granddaughter! Talk about a blast from the past!